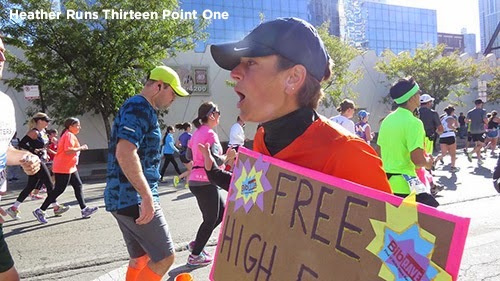 Sunday, October 12: cheered for Chicago Marathon runners! This week was a low mileage week. My arch pains are back, and I could feel my body fighting off a cold, so I didn't push myself too hard as to avoid actually getting sick. I think the changes in weather and more pollens in the air are the culprits, but also that I'm starting to get a little worn down. So, I rested a bit more than usual and took it fairly easy during the week. The weekend was much more eventful! 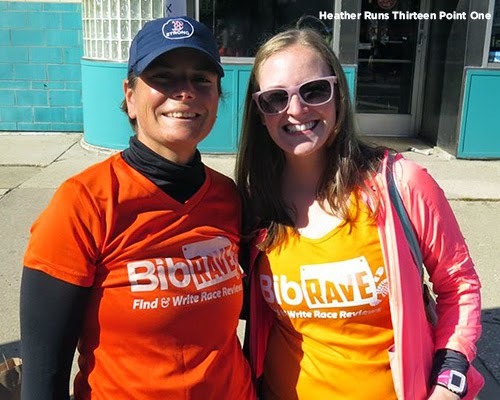 On Saturday morning, I headed to Oak Street Beach for a shakeout run hosted by Justin from Always Running Forward and BibRave. Unfortunately, I was running late (thanks to public transit) and they had already left when I got there. Doh. They weren't too far ahead, but I am much slower than those in the group, and I knew I wouldn't be able to catch up. I used GPS to find the final destination and ran on over, taking what I was hoping to be a quicker route so that I wouldn't get there too much later than the rest of the group. I had to do quite a bit of walking so I could check that I was heading in the correct direction (I felt pretty lost up there haha). Luckily, I made it and most people were still there. Beautiful day for a Shakeout Run. I ran into Cass about a block away and she pointed me in the direction of Glazed & Infused. It was SOOO great to finally meet the BibRave gang - Tim, Jess, and Julia (I felt like we were already friends, the amount of interaction we have via email and social media! ), plus some other runners. Did I mention Glazed & Infused had free doughnuts for us?! I ate a red velvet (which had a cream cheese frosting) and was in heaven. Thinking about it makes me drool. If you're ever in Chicago, definitely hit them up – they have a few locations. Tim, Julia, and Jess in person! 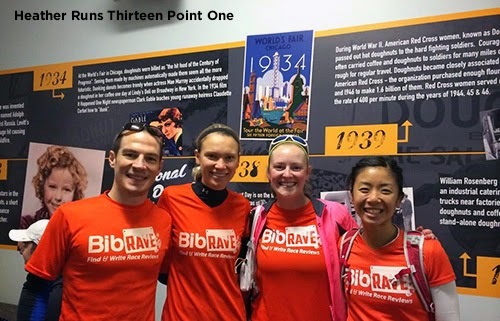 After some chatting, I headed home and ran another 2.66 miles, then finished working on my signs, typed up a list of all the people I was looking for (name, bib number, corral, and ETA) and got all of my stuff together in preparation for the BibRave Cheering Station the next day. It's not a BibRave Cheer Station without doughnuts. 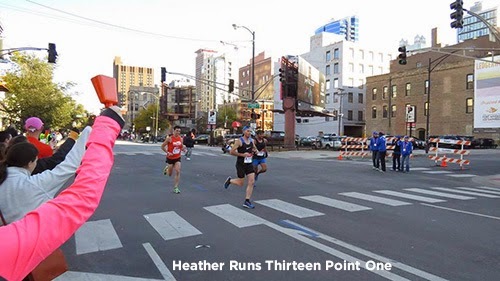 I woke up bright and early Sunday to head to the Chicago Marathon and cheer for my friends, family, and strangers as they worked their way towards completing 26.2 miles. I've never been to cheer before, and had an absolute BLAST. 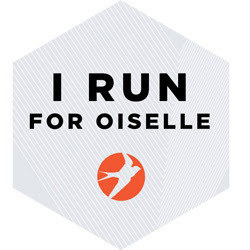 It was so inspiring to see everyone out there being amazing, and I'm proud of each and every runner. It was so great to meet Angie and her husband, Josh, and cheer alongside a great group of people at mile 11.5. 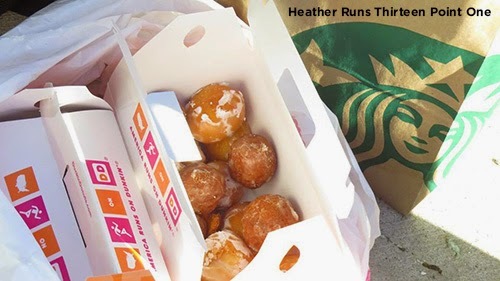 My mom and I brought some Dunkin Donuts Munchkins (if you know us BibRave Pros or join in on #BibChat on Tuesday nights, you know how much we love doughnuts... and food) and some other friends brought coffee, bagels, and pastries, so we had quite the spread. Tim, Julia, and Jess came by pretty early, because they are speed demons, and I loved seeing them fly by with smiles on their faces. They looked so graceful, as if they were gliding, making it look easy, though we all know it's a lot of hard work and dedication. There were a lot of cheers and high fives exchanged. It was so exciting when I spotted someone I knew and could cheer for specifically – with their sign, yelling their name, and lots of cowbell. Sometimes it seemed like a miracle to spot someone I knew because it was so incredibly crowded and fast paced. The different signs I held up throughout the day. I had snagged myself one of the cowbells from the cheer kit and yelled my voice out for everyone coming by. Angie gave out high fives and the runners loved it. It was great to see so many make their way over to high five! Even ones from the left side of the street. I also got a kick out of cheering for people by name (some put their names on the shirt or arm) and seeing them smile or give a thumbs up. I hope we helped give runners and extra pep in their step and made them feel good about themselves. They were accomplishing such a feat, and I loved being witness to it. I was working that cowbell! Photo courtesy of Angie. I was really disappointed when I missed people (Mike, Kim, Sarah didn't see her sign... and I'm sure a few others didn't either... my bad. I did the best I could, I promise you.). It got pretty crazy and was hard to find people, sometimes nearly impossible with the crowds. I even missed my aunt :( I was so happy my friend Meg kept an eye out for me and came by for a quick hug. Loved seeing her and she was doing amazing - she even looked great! I know I don't look that good when I'm running. Go Steph! Hilarious sign by Angie. BibRave Pros! Photo courtesy of Angie. Steph (running her first marathon of #marathonpalooza) stopped by for her pickles, as did Sarah for her Snickers. After they had gotten their goodies and the crowd had thinned a bit, Angie and Josh handed out some Clif Shot Bloks, Gummy Bears, Swedish Fish, and the Snickers, which were all a big hit. Angie and Josh brought so much awesome stuff for the runners - they are fantastic spectators! By this point, we all had lost our voices to some degree. Angie in high five action. Photo courtesy of Angie. I should mention the spot we were standing was right by a Divvy bike station. All of the bikes were gone, but in the street (the course) was a thin, orange cone-like type object and a car curb that was a safety hazard to the runners. We usually stood in front of it so runner's wouldn't trip, but a course marshal kept telling us to get off the street. Once he moved by, we went back out. Josh, with his booming voice, ended up saying 'watch out for the cone!' over and over, so runners who might not have seen it wouldn't get hurt. Being runners ourselves, we would NEVER get in the way of the runners unless it's for a good reason. We were preventing people from tripping and not being able to finish – that would have been horrible and sad to see. After the majority of the runners had passed, Angie, Josh, myself and my mom headed over to the party area, but then decided to try and get to the finish. Angie and her Josh were meeting up with some others to see a friend running near the finish. Unfortunately, we had to get home for a family dinner and didn't think I'd be able to see anyone else – it was pretty crowded. One more before parting ways. I've got to say, I'm pretty tired from the early mornings and am sore from ringing the cowbell, I can't imagine how I'd be feeling if I ran the 26.2 miles! You runners are my idols! You can read more about the experience through Angie's eyes here. P.S. 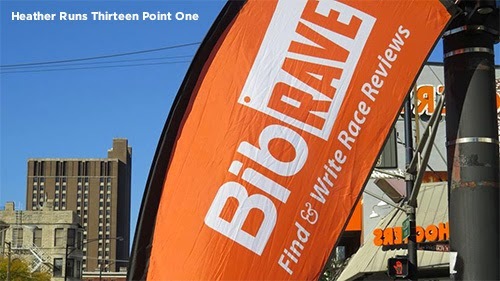 Make sure to review your race(s) on BibRave.com, and join us for #BibChat tomorrow night at 8pm CT to talk about staying sane while adding miles with a chance to win a free Wireless Sport+ headphones. 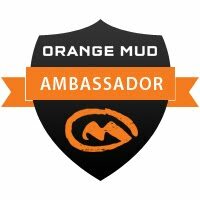 Read my initial review here. 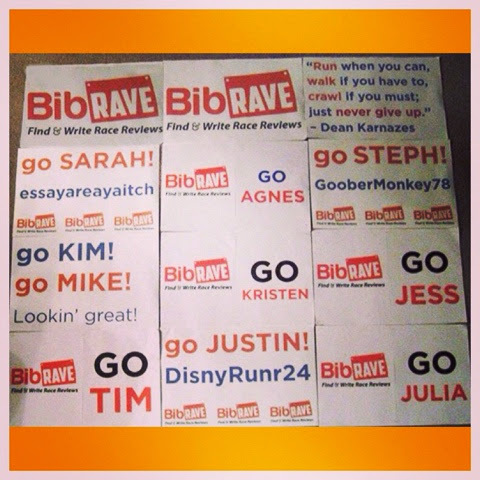 If you questions about how #BibChat works, let me know! I didn't really know what bib rave was. Thanks! Oh, and I don't like doughnuts but that one looks fabulous! The donuts look spectacular! I loved all the photos/stories from Chicago this past weekend - how awesome you were there. It was a really fun and exciting weekend! I'm thinking about putting my name in the lottery for next year... Eek!